You are here: Home / Diary / Kong Treats Winner! I am disgruntled no longer! Why? 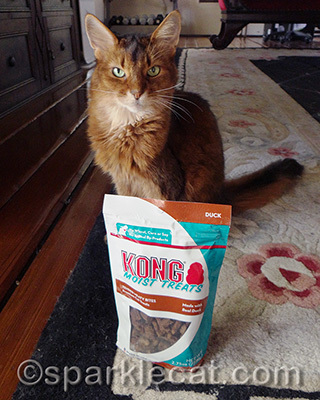 I have a winner for this package of Kong Moist Treats! And it is a pair of longtime blogging pals! The treats are on their way to you two as of today! I hope you enjoy them. 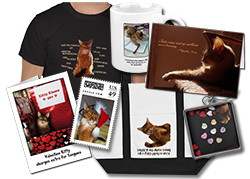 I don’t have a winner for the gift from my Designer Cat shop yet because I haven’t heard back from them. If you entered, check your spam filters on your email to make sure my message to you didn’t get snagged! If I don’t hear back from the name picked by Rafflecopter before the deadline, I will have to choose another! In the meantime, I have an awesome new St. Patrick’s card for you in my shop! Big congrats to Emma & Buster! 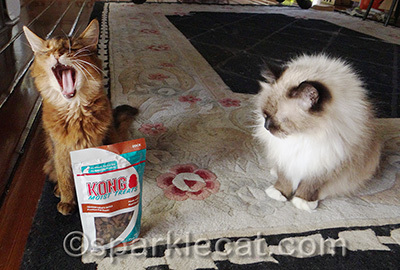 Concats Emma and Buster..enjoy yous treats!! Cool! Concats to Emma & Buster! We know they will enjoy the Kong. Concats to your winner. If Boodie really wants a pack, Iâ€™ll send one to her although Iâ€™m planning on using it as a prize. Can you believe that even though I told the Kong folks that I wasnâ€™t doing the review, they keep bugging me? Concats to the winners! It was nice of Boodie to help you out today too! Hooray for Emma and Buster! congrats to the winners! We have some and used them in doggie class last night. She loved them. 😛 – Alana. Yay for the winners. I’m sure they’ll enjoy their treats. thank you furry much. we’re excited to try them. Congrats to Emma and Buster!!! Enjoy your treats!! Congrats to Emma and Buster. Concats to Emma and Buster! Congrats to Emma and Buster. We know they will enjoy those treats. Yum. Hope all have a fabulous day. Concats to Emma and Buster! Hope they like the treats! Congrats to Emma and Buster! 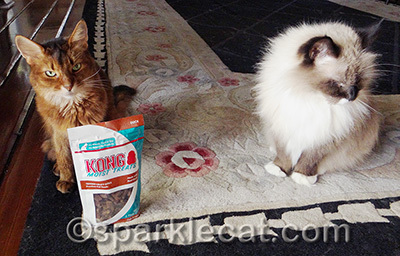 We hope they like the treats! 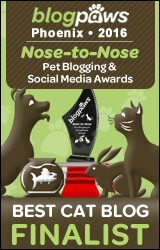 Concatulations to the winners!!!! Enjoy!!!! !